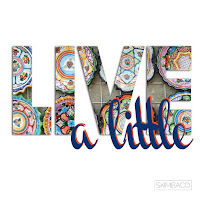 This week's Live A Little is about the importance of (day)dreaming. I was going to get all philosophical about it until I realized that Blondie already said everything I wanted to say about it. With a backbeat, even. And a super cute blue jumpsuit ensemble on this TV special from 1979. As bad as the economy is right now, dreaming is still free. (I love Debbie Harry's political rant in the middle of Heart of Glass!) Take advantage of it and let your mind wander. My dreams right now are about fall fashion and taking a cruise someday. What are you (day)dreaming about? I'm daydreaming about seeing the fall leaves change colors. I need to take a drive to the mountains! Love! I am dreaming about sleeping in, kids that give themselves baths and a world at peace. Seriously.